Woodpile BBQ Clawson review, pics, hours, and menu info. Woodpile BBQ Shack is located on S Main Street south of 14 Mile Rd in Downtown Clawson MI. Woodpile BBQ Shack offers roadside, carry out only BBQ. While the food is designed for grab ‘n go, they do offer a covered, outdoor seating area with picnic tables (and kerosene heaters in the winter). The Woodpile BBQ Clawson menu is simplistic and everything is available ala-carte. You can order from a choice of 6 different meats (beef brisket, pulled pork, pulled chicken, Jalapeno cheddar sausage, St. Louis spare ribs, and smoked half chicken) by the 1/2 pound. Sandwiches are available on bakery buns from Crispelli’s restaurant and bakery of Berkley. Sandwiches on the menu feature half-lb portions of Woodpile BBQ meats. Woodpile offers 6 sides (again, to be ordered ala-carte style). Sides include – cornbread, slaw, pit beans, seasonal veggies, mac & cheese, bbq mac & cheese. Woodpile features a few dessert options including milkshakes, homemade bread pudding, and 10 different flavors of Treat Dreams ice cream. I ordered a Texas Trinity meal from Woodpile BBQ Clawson so that I could sample 3 of their BBQ options in one dish – their ribs, jalapeno cheddar sausage, and brisket. All 3 of the meats were very tasty and prepared well. I was especially impressed with the sausage. The sausage had a nice, spicy kick and was infused with a generous amount of yummy cheddar cheese. Woodpile BBQ Shack features 4 sauces – Woodpile Signature (sweet + heat), Sweet, Honey Mustard, and Carolina Vinegar. For the purposes of this review, I chose Woodpile Signature and Carolina Vinegar. I would have loved to have tried the other two, but I was only “allowed” 2 sauces with my carry out order. I’m not sure why there is a 2 sauce rule at Woodpile but I found it very restrictive. We’re talking about a couple of ounces of sauce served in mini solo cup containers. Would it have killed them to allow patrons to have 4 choices of sauces? This is akin to asking for an extra ketchup packet at MacDonald’s and being denied. The Carolina vinegar tasted generic to me but I was very impressed with Woodpile Signature. Signature isn’t kidding about their sweet + heat claim. The sauce comes on hot and then has a sweet glaze taste that goes really well brisket. I haven’t tasted plenty of hot and sweet sauces in my day and was surprised how well the Woodpile Signature sauce combined the two extreme. Two thumbs up! While I enjoyed the food at Woodpile BBQ Shack, I do have one issue with the menu. My biggest problem is that there are no sides included with any meat or sandwich menu option. Because everything is ala-carte, you can rack a big lunch bill in a hurry. Even the Texas Trinity meal doesn’t include one side dish or drink. I bought 1 Texas Trinity and 1 regular order of Mac & Cheese and my order came to $19+ (and this didn’t include a drink). I could easily go to Lockhart’s BBQ or Union Woodshop and enjoy a meal (with sides) and a beverage for that much money in a sit-down restaurant. I can’t imagine ordering a $14 sandwich at a takeout place that doesn’t come with (at least ) a side and beverage. If you want a more authentic roadside BBQ experience with a broader menu and much better prices, you might want to try Country Smoke House in Almont. 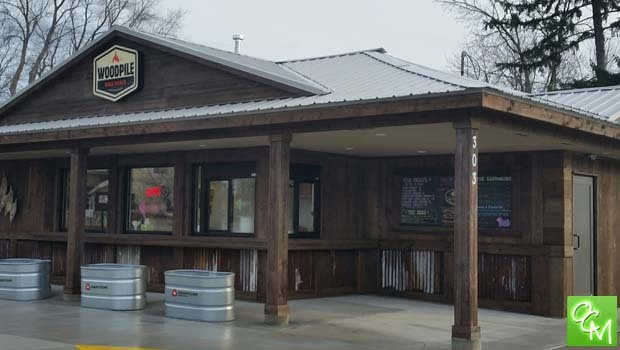 See related articles and posts below for more Oakland County MI BBQ Restaurants or our REVIEWS/RESTAURANTS tab for more Oakland County and Metro Detroit MI restaurant reviews, pics and more. For complete menu info for Woodpile BBQ Clawson, visit their website.